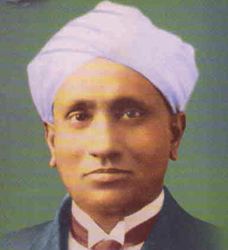 C.V.Raman was a scientist in Physics, who won nobel prize in 1930. His discovery of the 'Raman Effect' made a very distinctive contribution to Physics. He was knighted by the British Government in 1929. He was also conferred the highest title of 'Bharat Ratna' in 1954. Raman was born on 7th November,1888 at Ayyanpettai in Tamil Nadu. He had his education in Visakhapatanam and Madras. After getting top ranking in the Financial Civil Service Competitive Exam, he was appointed as Deputy Accountant General in Calcutta (Kolkata). In 1917 he became the professor of Physics at the Calcutta University. After 15 years service at the Calcutta University, Raman shifted to Bangalore and became the Director of the Indian Institute of Science in 1933. In 1943 he founded 'Raman Research Institute', near Bangalore. The 'Raman Effect' was a demonstration of the 'Collision' effect of light bullets (photons) passing through a transparent medium, whether solid, liquid or gaseous. Raman's publications include 'Molecular Diffraction of Light', 'Mechanical Theory of Bowed Strings' and 'Diffraction of X-ray's', 'Theories of Musical Instruments' etc. Raman conducted pioneering research in musical acoustics, particularly on Tamboura, the well known Indian musical instrument.